A few weeks back the Emerald riders met with the well organised group of social riders from Blackwater. Well organised is something of an understatement – they have their own clubhouse and grounds just on the edge of Blackwater. Bar, large kitchen area, showers and toilets, outdoor stage, burnout pad and drag strip, kids playground and more. It’s amazing what you can achieve with a bit of organisation and a supportive Council. A good time was had by all – live music, a good feed and an ale or three. Most of us Emerald riders camped the night. After a hearty breakfast we hit the road for the short squirt home. About the time St George dropped out of the NRL finals, Rod rang and asked if I was interested in going to the NRL grand final. His mate Glen had a block of tickets available – they are mad St George supporters and lost interest after they were defeated. 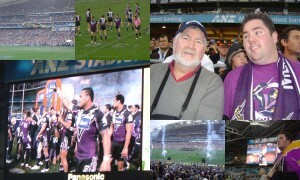 Both Rod and I barrack for the Melbourne Storm so going to a NRL final seemed like a good idea. (I have been to an AFL GF albeit in 1969. I can’t remember who was playing – I was on an end of season footy trip.) A quick check with Jan, and a bit of time on the internet saw me ride the motorbike into Rocky on Saturday morning, flights from Rocky to Sydney via Brisabane, trains from the airport to Strathfield and a “short” walk to our accomodation in South Strathfield during which I got drenched in a Sydney downpour. Rod drove up from Canberra after he finished work on Saturday arvo. Sunday saw us drive out to Parramatta for a squizz and then on to Homebush for the final. Us Storm supporters were well out numbered but as they say – winners are grinners. Wow – what a memorable time we had. An early start the next morning. Rod dropped me at the station and then headed back to Canberra – he had to work. I had a direct flight back to Rocky, then a ride back to Emerald, proudly flying the Storm flag from the back of the bike. As the bank advert says – a “priceless” day and a bit with Rod, and as a bonus another Grand Final flag to brag about.